100 Real Life Flash-a-Maniacs share their Stories & RESULTS! ”It is WHAT you do in the gym and HOW you do it that gets the RESULTS you really want. People go to the gym because they want a new body, improved health, more energy, to feel better, to be more confident, to be lean & strong, to lower stress, etc. The ‘gym’ doesn’t achieve these goals any more than a kitchen bakes delicious cakes! People come to Flash because we are the WHAT to do & the HOW to do it. Flash is a supportive community, where you exercise side-by-side with inspiring people with their own success stories. At Flash, we provide the daily guidance, the top notch instruction, the smarter, more experienced programming, and are not afraid to hold people accountable for achieving their goals they’ve asked us to help them achieve. We will help you to, and then expect you to, raise your own standards to match the high standards we place on ourselves- to get you RESULTS. Is Flash for every single person? Definitely NOT. ​If you want a room full of machines to do mindless exercises and play with your phone- or if you are a steroid-using meathead doing your best to be “hard-core,” “jacked,” and can’t stop flexing in the mirror- if you gym goal is to Instagram your booty or strut around shirtless, show-off how “Beast Mode” you are..., if you are someone who cannot leave your ego at the door and make an effort to be a friendly, positive addition to our community...Flash Fitness isn’t for you. But, if you want a friendly, supportive and effective place to make positive changes to your body and your health...we warmly welcome you to come give us a try! We can’t change the whole fitness culture, so we CREATED our own fitness culture, one that is aligned to the needs, values and wants of the rest of us! Everyone should have access to a gym that is comfortable, inviting and of course, effective! Thank you for stopping by our page and taking the time to look around! If you have a few minutes, please watch the video and see what real Flash members have to say about their RESULTS & experiences at Flash. What could YOU accomplish if you learned to TRAIN SMARTER? Best Fat Loss coaches in Bangkok. All of the programming at Flash Fitness is written by Jeff Andora, who has spent 23 years perfecting our Flash Fitness Programs for faster fat loss. That is OVER 40,000 HOURS OF PROGRAM DESIGN EXPERIENCE. He and his wife, Coach Ritah, have a long, successful history of helping people like you actually get results from the time spent in the gym. ​It has been said that to truly be an "expert" in a field, one should have 10 years or 10,000 of focus and training. Well, combined, Jeff and Ritah have more than tripled that. You can be assured that you will always be working with true experts at Flash Fitness. ​Flash Fitness is an old-school FLASHBACK to the days when caring, knowledgable fitness experts ran the gym and NOT business/sales people cashing in on useless gimmicks and trends. Look at the testimonials. Look at the videos above. Come talk to the members doing the program. When you walk into this place, you will always be surrounded by amazing fat loss success stories from people just like you. 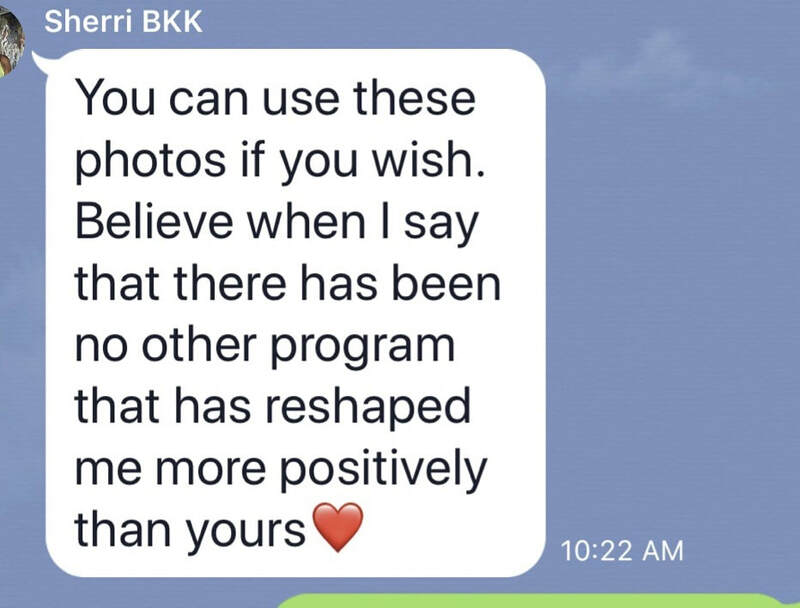 No other gym or trainer in Bangkok has the PROOF OF RESULTS that our little gym has. Nobody even comes close. 1. NOT all exercise is created equal. Just “exercising” and burning calories doesn’t guarantee results. You need to design your program specifically to meet your particular goal. Too many people waste time doing the wrong exercises for their goal, leading to slow or NO results. At Flash, we take out all of the guesswork for you by designing our programs specifically for body transformation goals. 2. Getting fit is not just about burning more calories and eating less! One of the biggest mistakes people continue making is assuming that the goal of the workout is to burn calories. At Flash, our goal is to create the metabolic, hormonal and physiological changes needed to get you back into good general health. This allows faster, more efficient loss of body fat. SMART PROGRAM + EFFORT gets you fit! Many gyms must try to impress you by filling their gym with whatever new fitness equipment comes into trend. At Flash, we understand RESULTS ONLY COME FROM PROPER KNOWLEDGE, PROPER PROGRAMMING, PROPER EXECUTION and PROPER COACHING...Not a particular piece of equipment. In the hands of an expert, there is no better fitness tool than free weights used properly. 2-3 30 MINUTE WORKOUTS A WEEK IS ALL IT TAKES! ​We SPECIALIZE! WE Specialize in FAT LOSS & Body Transformation. What are people saying about Flash Fitness? ARE YOU READY TO COME GIVE FLASH FITNESS A TRY? Feel free to contact us if you have any questions or would like to schedule a time to come by! Flash Fitness is located in the Mookda Building, on Sathorn Road between Sois 6 & 8. We are located on the 5th floor above LalaMoves, Next door to Hertz Car Rental and directly across from the Singapore Embassy. 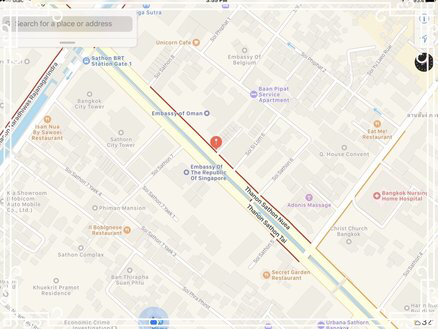 Flash is just a 5 minute walk from BTS Station Chong Nonsi and easy to get to from Empire Tower, Sathorn Square and the Sathorn City Building. Where is PREMIUM Personal Training Studios by Flash Fitness? Yes. I am ready for RESULTS.